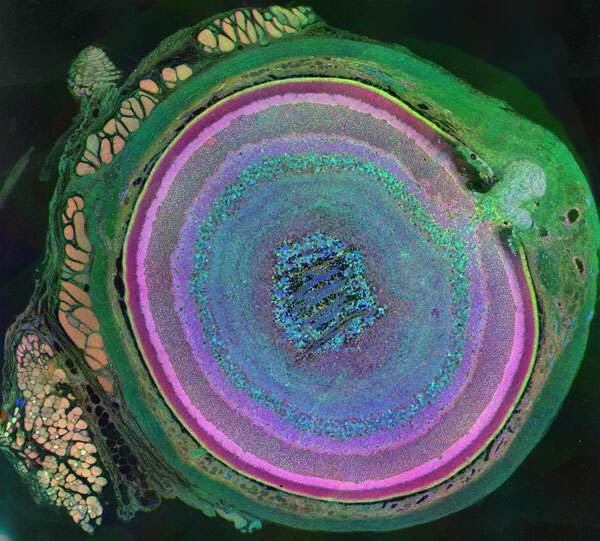 Bryan Jones, an NIH-funded retinal neuroscientist at the University of Utah’s Moran Eye Center—and a photographer—used a colorful technique called Computational Molecular Phenotyping (CMP) to create this image. Developed by Moran’s Robert Marc, CMP associates each cell type with a color fingerprint reflecting its unique metabolism and chemistry. Here, Jones labeled retinal cells with antibodies against metabolites called taurine, glutamine, and glutamate. He then assigned the signals from each antibody to red, green, and blue channels in image processing software, creating this striking piece of artwork. But, there’s more to this picture, which is featured in the Life: Magnified exhibit, than its visual appeal. Marc and Jones are leading the effort to map the connectome of the eye: identifying the eye’s cell types and how they are wired together to transmit information to the brain. They’re using CMP in this mapping process, to help them understand how vision works in a normal, healthy eye. They’ll then apply their findings to blinding diseases such as retinitis pigmentosa and age-related macular degeneration, in which the retinal structure and circuitry changes as the disease progresses. They hope this new knowledge will help researchers develop treatments to rescue vision loss. It’s so beautiful how we are created.